Do We Know Who Will Win in Cambodia’s Upcoming Elections? Cambodia is experiencing its hottest season and not in terms of the weather, but because of the final campaign stages leading up to the National Assembly elections scheduled for 28 July 2018. The National Election Committee has initiated the process of registering political parties that will participate in the elections. The first parties to have registered include the League for Democracy Party, the Khmer Democratic Party, the Beehive Social Democratic Party, the New Light Party, the Khmer Economic Development Party, Grassroots Democracy Party, and the FUNCINPEC party, the force behind the royalists that in the past ruled alongside the former communists, but it is now at the periphery of the power struggle. The list at present does not include the main party in Cambodia that has, de facto, been ruling the country since 1979, with the exception of a few intervals during the 1993-election preparation stage. Today, the former communists are once again poised to win. Saying that all the other parties have at least a chance to win is equivalent to saying nothing at all. Most parties are completely unheard of by the voters, while others represent interests of the few and have no serious ambitions to win. Their participation in the elections is essentially a cover, the entourage of democracy to legitimize the upcoming win by the Cambodian People’s Party, headed by the irreplaceable Prime Minister Hun Sen. Before 1991, this party was called the People’s Revolutionary Party of Cambodia and was closely linked to Vietnam and the USSR. From 1991 onwards, after the dissolution of the Soviet Union and the withdrawal of Vietnamese forces from Cambodia, the party was, as demanded by the new era, renamed and became the Cambodian People’s Party (CPP), which along with its undisputed leader Hun Sen, has been ruling the country for almost twenty years. This long-term reign by Hun Sen, who today is seemingly one of the world’s champions in uninterrupted long-term rule (after all, he became Prime Minister back in 1985), speaks volumes to the abilities of this individual to not only take power in his hands but also keep it under different circumstances. Hence, he is yet again poised to embarrass all those observers who predicted that he will lose in the general elections in 2018. Recently, it appeared as though everything was against him, as his political opposition was making substantial gains and performed impressively in the previous elections in 2013,and despite considerable pressure from the CPP and its administrative resources, the opposition managed to win 58 seats in the Assembly and 2,295,000 votes, thereby losing 67 seats and 2,555,000 votes to the CPP. Hence it appeared to many observers that Hun Sen’s star was waning. His authoritarian manner of communicating with his subordinates, who almost on their knees recorded his orders during the so-called period of “on-site government”, was in stark contrast to that of the opposition leaders, who highlighted their democratic qualities, and abilities to speak languages other than Vietnamese, unlike Hun Sen. They had promised that on winning they would build a “modern country”, which could gain experience and support from the USA. Only one and a half years ago, the opposition, having united into the Cambodia National Rescue Party, was confident in its success. But today, the situation has completely changed, Cambodia’s main opposition party no longer exists. One of its leaders, the perpetual opponent and avid nationalist, Sam Rainsy, is abroad from where he has been forecasting “big problems” in Hun Sen’s future. Another leader, a former teacher, Kem Sokha is still in Cambodia but behind bars on charges of treason. Both of these opposition leaders are trying to remain influential in these elections, for instance, in February 2018, in Australia Sam Rainsy told journalists that Cambodia needed help from other Western nations in order to pressure Hun Sen’s government as Cambodians themselves are not capable of bringing democracy back to life in their country. Rainsy criticized Japan for their continuous support of what he had dubbed “an election farce”. He also stated that because of the illegal dissolution of the main opposition force in the country, the Cambodia National Rescue Party (CNRP), and its subsequent ban, the international community should not accept the elections results because the dictator Hun Sen, according to Rainsy, had killed democracy in Cambodia. Another former leader of CNRP Kem Sokha, sentenced to 5 years in prison, has been appealing to the Khmer electorate “Do not vote if you want us to change our country for the better. By not voting you’ll be showing us your whole-hearted support.” Kem Sokha also appealed to the international community not to recognize the results of the July elections stating that they will not transparent or lawful. The statement also includes a plea addressed to Japan to stop financing the election committee. Only those parties, that had and still do not have any chances of success, are prepared to join the boycott. Hence, for example, the former leader of the Khmer Power Party, announced that his party was not going to be taking part in the elections and it will not recognize its results. Another leader of this party, which many former opposition members who were still free joined, Soung Sophorn, appealed to the Supreme Court of Cambodia to repeal its incorrect decision to disband CNRP (in November 2017), as the decision was not supported by any evidence. 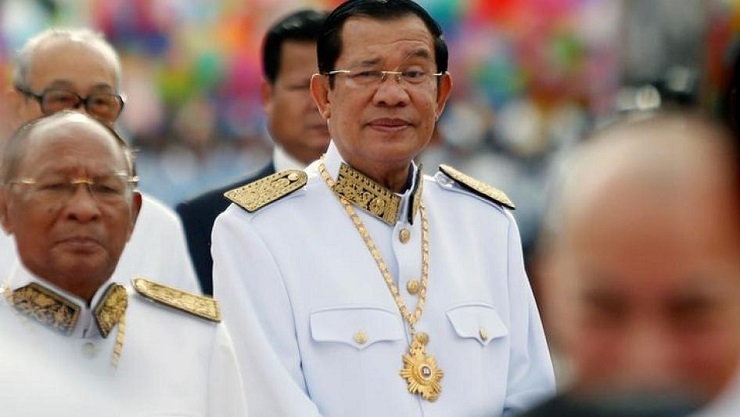 All of these struggles surrounding the elections have practically no effect on the position of the chief demiurge of Cambodian politics, Prime Minister Hun Sen. This truly experienced politician always shows confidence in his success and accuses his political opponents of treason. Hence, for instance, on 3 April 2018, in his message to the voters he noted that Cambodia had avoided the threat of a “color revolution”, which the opposition party had been meant to organize, and that the opposition had conspired with foreigners to overthrow the legitimate government.” He pointed out that in November 2017, based on government recommendations, the Supreme Court had made a decision to disband CNRP thus ensuring that the “color revolution” had failed. The irreplaceable Khmer Prime Minister’s role today is not as much that of an election participant but more of the ultimate arbitrator. So what is the core strength of Hun Sen and his party, with its corrupt practices that allow high-level officials accused of theft to go practically unpunished. Hun Sen’s children are also not only millionaires but also hold the ranks of general in the army and the police. The descendants of veteran party members are also in positions of power, while CPP itself is essentially a symbiosis of Chinese business and Khmer administrators, who have played dominant roles in the country for quite some time. Many Cambodians, especially those living in cities, recognize this, as evidenced by the results of the municipal elections in Phnom Penh and Battambang, where the opposition won and the city dwellers are ready for a change in power. In politically active circles of Cambodian communities there is a clear need for new blood. But this existing demand cannot be met because of a people shortage. Naturally, there are suitable candidates, but they are either abroad or in jail. Hun Sen is waging a war against his political opponents using the rules of any information war. For instance, at the end of 2017, an influential independent newspaper Cambodia Daily was closed apparently because of its “debts” and the chief editor of another weekly newspaper Phnom PenhPost was forced to retire for distorting facts. At least fifteen radio stations were ordered to stop broadcasting programs from Voice of America and Radio Free Asia. But Hun Sen’s artfulness is, in fact, in essence his ability to always state that democracy does actually exist in the country. Thirty six political parties, more than 5000 associations and non-governmental organizations are officially registered in Cambodia. Thus democracy does exist and according to the Prime Minister is even flourishing. He can even go as far as to claim that the king himself is on his side and that he had already appealed to people to use their right to vote and not follow the opposition by boycotting the elections. Hun Sen’s strategy is clear, and based on assessments conducted by the most well-informed Khmer sociologists, the upcoming elections are pointless and are indeed a complete waste of money. This is all just a game. We are already 100 % sure that the ruling party will win the elections. At the same time, protests against Hun Sen’s policies in the West occur periodically, but the ruling party is not under any serious threat from Europe or the USA. The European Union Ambassador to Cambodia, Christopher George Edgar, said that the elections this year, without a single viable opposition party, will not be legitimate and that the EU has no trust or faith in them. But still no real action followed these words. American senators have threatened Hun Sen with sanctions, but nothing concrete has happened on that front thus far. As it turns out, Hun Sen holds “many aces in the hole” such as support from China, Vietnam and even Russia, as well as his own will and experience. But, most importantly, under his leadership, the country is enjoying stability and the national economy is developing steadily, growing from 5 to 8 % year-on-year. The country has maintained a steady 7 %-increase in its Gross Domestic Product (GDP) over the last 15 years. According to the Ministry of Labor, goods valued at 10.79 billion US dollars were produced by more than 20 Cambodian plants last year, and 7-million worth of these goods were exported. Based on the 2016 World Bank report, 45 % of the clothes were exported to the EU and 25 % to the USA. People see a connection between the growth of the economy and improved living conditions with the People’s Party. In certain aspects this party can even be compared to the Japanese Liberal Democratic Party (LDP) of the 1960s and 1970s. LDP was always involved in corruption scandals, its leaders were unpopular, but the Japanese entrusted the reigns of power to this party, which had proven that, despite all the scandals, it was capable of governing the country. Similarly, during the rule by the People’s Party, the country has maintained steady economic growth, as well peace as at the borders with its neighbors, and people’s living standards are gradually improving. Hence, even if Cambodians do sympathize with the opposition, its appeals will most likely fall on deaf ears and the Khmer people will probably vote for Hun Sen’s People’s Party.